Get ready for a new full-loop communication tool that reimagines the power of 360 feedback. Everything DiSC 363® for Leaders combines the best of 360 with the simplicity and power of DiSC® to deliver a more productive, insightful, and informative experience and a road map of actionable steps leaders can take to improve their effectiveness. 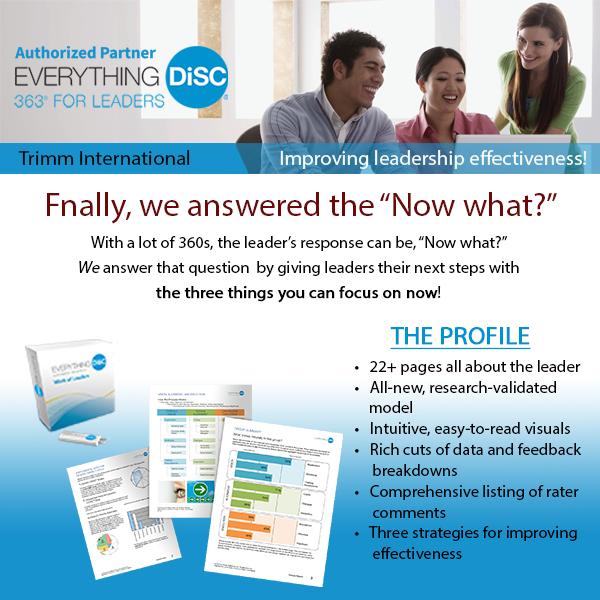 With a lot of 360s, the leader’s response can be, “Now what?” Everything DiSC 363 for Leaders answers that question by giving you the next steps with the three things you can focus on now—strategies to improve your leadership effectiveness that can be put into action immediately.